The 2016 Dodge Viper was built to perform like a fine thoroughbred on the track. A handcrafted 8.4-liter, all-aluminum massive V10 engine with a manual transmission that generates a mind-boggling 645 horsepower with 600 pound-feet of torque powers the coupe, while it produces a superior handling experience with a high-performance suspension available in a single or two-mode version that hugs the road like a tailored jacket and never lets it go. In a vehicle this sharp, a standard set of brake won't do, which is why the Viper includes a Brembo brake system which stays firm and responsive at any speed the coupe may approach. Overall the 2016 Viper is nothing but impressive, particularly in its zero to 60 mph speed test which shattered any performance expectations with a three-seconds flat time. 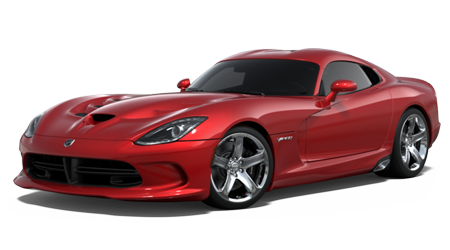 The 2016 Dodge Viper is available in five trim options: STR, GT, GTC, GTS, and ACR. Each trim comes with various handling and performance differences based on how drivers might be planning on using the vehicle. The base-level option might work best for those weekend warriors who love to get on an empty road and drive until there is no place left to go. The top-level and all-new ACR trim is the lasted addition into the Viper family and model includes Bilstein coil-over racing shocks, Kumho Escsta tires, carbon-ceramic brakes, and a louvered hood among other things. Interior wise each trim includes fine leather upholstery, an 8.4-inch touchscreen interface with the Uconnect system and a 7-inch cluster display scene. The upper-level trims add in an upgraded suspension, an extreme wing rear spoiler, an 18-speaker Harman Kardon audio system and leather six-way power seats. However, no matter which version of the 2016 Dodge Viper a buyer may choose, the coupe will end up owning the road as one of the most high-performance crafted vehicles available to own. When you own a car as powerful and fast as the 2016 Viper, safety becomes one of the most important issues to consider. Luckily for buyers, the automakers at Dodge have never gone light on safety and the 2016 Viper scores high marks in that area. Every Viper includes a one-day training course for handling the vehicle, as well as stability and traction controls, a rearview camera, multiple cabin airbags among other things. The Brembo braking system continues to be one of the best options around for performance-based vehicles and will stop on a dime without much effort. Dodge remains one of the safest option around and its automakers continue to push the boundaries and limits of what safety can and will eventually be. Safety should not be an issue in the 2016 Viper, but that responsibility on the road starts with its drivers. The 2016 Dodge Viper was built to be out and the road, and for those bold drivers who seek adventure at every opportunity, the sports coupe is the vehicle to see. When you are ready to experience superior handling and performance, stop by Greenville Chrysler to schedule a test drive in the 2016 Viper today! Located at 5401 Interstate Highway 30, Greenville, TX 75402 we continue to be one of the premier dealerships in the entire area. If you are near the Rockwall, Commerce, Bonham, Paris, Sulphur Springs, and Tyler area.